Kevin Millwood started on the hill for the Mariners and actually pitched well enough to make the game a competitive one. That is, if you anticipate any offense off of former Mariner Brandon Morrow. Millwood pitched well, Morrow pitched better. Brandon Morrow is the one trade of Jack Z's that I never liked and never will like. Sure, Brandon Morrow wasn't really happy here in Seattle, but we totally mistreated him. First he was a starter, then in the bullpen, then back to being a starter. After working in the minor leagues for some time on being a starter, he came back up, once again, in the pen. We traded him away rather than deal with the issue. Now, looking back, we sure could use his arm right now. Even though the M's have plenty of up and coming pitchers headed to the bigs soon, if we were going to get rid of Morrow, we could have landed a lot more than Brandon League. The two are far from comparable in my opinion. Millwood ended up going a complete 7 innings and only gave up 3 runs. Only one of those runs were earned after a Kyle Seager miscue at third base with one out kept the inning alive. He had 4 strikeouts and only 2 walks and helped the bullpen get some much needed rest. 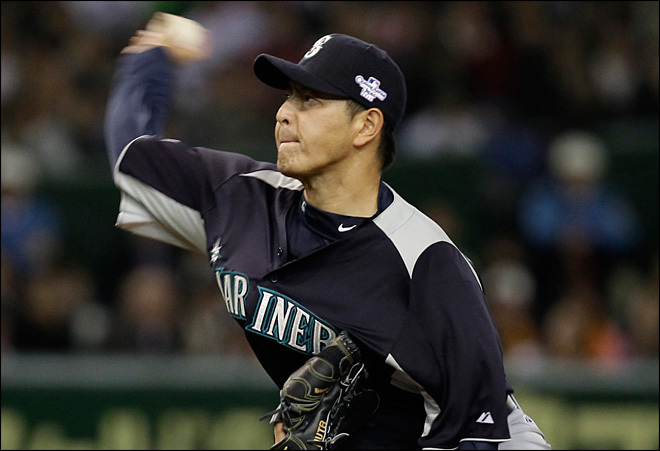 Hisashi Iwakuma came on in the 8th inning and he did not get the same results as Millwood. Kelly Johnson hit a leadoff single, Jose Bautista hit a ground rule double and then Adam Lind was intentionally walked to try and get a force at the plate. Edwin Encarnacion came up to the plate and payed the Mariners back for the 9th inning slam last night and hit one of his own. A deep slam to right field to blow the game open and leave the Mariners looking forward to tomorrows game. M's 0 - Jays 7. The M's couldn't muster anything up in the ninth inning and took the loss. Things to note however, Justin Smoak went 0 for 4 again today and struck out twice. That brings his average down to just .187 on the year. Kyle Seager, back in the lineup after 3 days off, went 2 for 3 with a double. Talk on the post game show was about whether or not Smoak should sit for a while and both Alex Liddi and Kyle Seager could remain in the lineup. I, for one, love the idea.